My name is Jill and I am starting this fund on behalf of my sister's family. As most of you know and will attest to, Jason and Christine Steiner are the proud and loving parents to four beautiful and wonderful children. 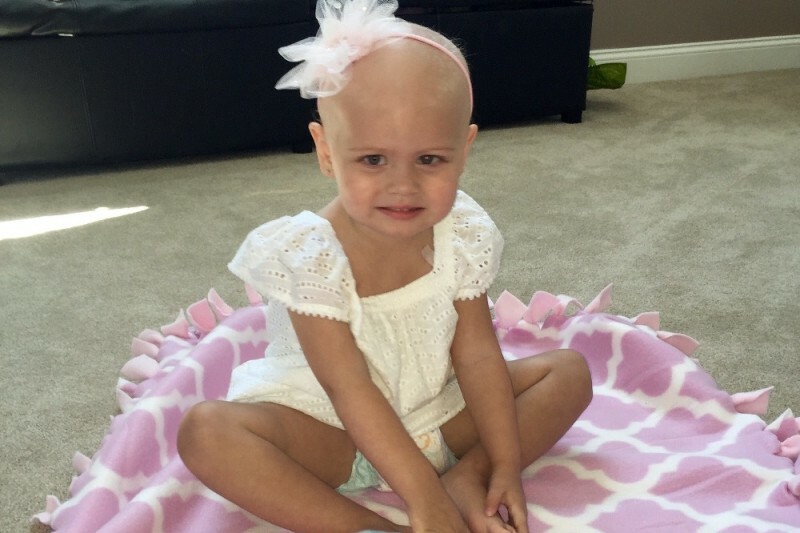 Unfortunately, while everyone was anticipating the end of the 2015 school year, they were told the dreadful news that their youngest child, 2 year old Olivia, had leukemia. While there were several things that were red flags to my sister, it was mostly her "mothers intuition" that told her something was wrong. This all started around the time Liv broke her foot (May 2nd). She was put in a walking boot for 4 weeks. About a week and a half after being put in the boot Jason and Christine started noticing bruises on her leg, the good one. They took her back to the ortho Dr. and she told them that it was totally normal, that they see it all the time. Olivia was hitting her good leg on the metal of the boot causing bruising. She was also unsteady learning to walk with the boot on so she would occasionally fall. Then there were the fevers, Christine brought her to her pediatrician three times in May for sick visits. She had always been such an easy baby but she started not acting like herself, she wanted to be held all the time, she was cranky, much more tired than usual, and just seemed different. There were also days that her coloring seemed off. Every time Christine took her to the pediatrician they checked her ears, throat, did a blood test...all the things they do when you bring a sick 1 year old to the Dr. Each time they said it must just be a virus, coupled with the fact that her 2 year molars were coming in (which also can cause a fever). Christine said ok and brought her home, trusting that what the Drs. said was correct. Another symptom was the back pain. Liv has always for the most part been a good sleeper. In the 2 weeks prior to Liv’s diagnosis she would wake up at night occasionally really crying saying "back hurts, back hurts”. Christine asked the pediatrician as well as the ortho Dr. about this and they both told her it was normal because she was in the boot for a month. It turns out that her back was hurting so badly because the leukemia gets into the bones and takes over spreading rapidly. The week before Olivia’s second birthday she was cranky, had no appetite, and the bruises were getting worse and worse. She is not a very clumsy kid, so we couldn’t figure out where they were coming from. Christine would get her out of her crib in the morning and she would have new bruises. In my sister’s gut she knew something was wrong, but on the other hand she had been to the Dr. 3 times in the last few weeks and they said she was ok. It all changed the morning after Olivia’s second birthday. My sister went to get Liv out of her crib and knew something was not right when she looked at her to see she was covered in bruises (a lot worse this time), she looked like she was an abused baby. Again, Christine headed back to the doctors. When she got to the pediatrician Christine explained to him what had been going on (this was a different doctor than the one who had seen Olivia in the previous visits) and he looked at her and agreed something was wrong. As they were talking he looked at Christine and said "does this happen often?" When Christine looked at Olivia, her teeth were covered in red, her gums were bleeding. He told Christine to go to Winchester Hospital where they would take her blood, and not to leave the hospital until he called and told them what to do next. Jason met Christine at the hospital and less than 5 minutes after he got there a nurse came up to my sister and said "Mrs. Steiner, Olivia's pediatrician is on the phone for you". Immediately she felt relief, thinking they would never give her such bad news over the phone, but unfortunately she was wrong. She got on the phone and the Dr. said "Christine I am so sorry to have to tell you this..... Olivia has leukemia”. In that moment our world turned upside down. I can honestly say that watching my beautiful, sweet niece fight this awful disease has by far been the hardest thing I’ve ever had to do. I wish I could take her pain away. I wish I could take away the pain my sister and brother in law feel every day having to watch their baby suffer and fight through this. I wish I could take away the pain and confusion Olivia’s siblings Hunter, Faith, and Emma feel every day not knowing or understanding why this had to happen to their baby sister. We are so blessed to be surrounded by the people we have in our lives. I have witnessed the love and good in people who have come forward to show their unending support to this family by way of meals, gifts, flowers, rides for the kids, etc. (Thankfully the list goes on!) We also have countless people storming the gates of heaven on behalf of Olivia, who we lovingly nicknamed Brave Livy, with prayers for God's healing touch. There are so many more of you who have asked over and over “what can I/we do for them?” That is the reason for this fund. By showing your support here, you will be allowing them to put your well wishes to good use in the manor they see fit, with their mounting, unexpected expenses. Whether it's for gas & parking, meals, or medical expenses, it will be a heartwarming gesture. Please feel free to share this, and most importantly, please keep those prayers coming for our sweet angel. She is in for a long fight! Again, we thank you all so much for your love and support for Olivia, as well as our family. God bless Olivia and her family. We are praying for you all. My thoughts and prayers are with your family at this difficult time.